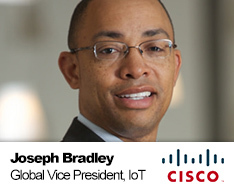 As IoE Evangelist and Vice President of the Internet of Everything (IoE) Practice in the Cisco Consulting Services (CCS) organization, Joseph M. Bradley ensures the world’s top business and public sector leaders understand how to capture their share of $19 trillion in value that IoE will create over 10 years. In this capacity, he leads a team of technology and business consultants who are uniquely qualified to assist CXOs, government leaders, and their management teams to realize the potential of IoE in today’s rapidly changing world caused by the convergence of mobile, social, data, and cloud computing. Bradley was instrumental in developing the next-generation consulting model for CCS. The methodology provides a data-driven path to outlining what customers need to do today to capture value from IoE. Further, the model leverages the IoE Practice’s proprietary customer research and network analytics to identify hidden value that can be realized by lighting up “dark assets.” CCS helps customers move from their current state of operations to an IoE-enabled enterprise through the use of rapid prototyping, analytics, and process change. Once the methodology is complete, the customer has the ability to innovate, which provides a feedback loop to enable continuous improvement. Bradley built the foundation for CCS and the IoE Practice by directing the research and production of Cisco’s influential IoE thought leadership titled, “Embracing the Internet of Everything To Capture Your Share of $14.4 Trillion” and “Internet of Everything (IoE) Value Index: How Much Value Are Private-Sector Firms Capturing from IoE in 2013?” This project was followed by further groundbreaking research that showed the total IoE value at stake for both enterprises and public sector organizations to be $19 trillion. Bradley’s dynamic and engaging style, combined with his passion for disruptive technologies, inclusion and diversity, and the role people play in driving technology innovation to create a better world, have made him a popular speaker and thought leader worldwide as well as within Cisco. His recent industry keynotes include, The Mobile Show Middle East 2014 and Cisco Connect in Chengdu, China. Additionally, his work has appeared in the Wall Street Journal, InfoWorld, and The Financial Times. Bradley’s recent EBCs include meeting with CXOs at the world’s top companies including Honda, MetLife, Nestle, and the US Olympic Committee. Before Cisco, Bradley held several leadership positions at C3, including CEO, CFO, and senior vice president of shared services. Previously, he was general manager of the Data Communications group at AT&T. His career began at Pacific Bell, where he worked in finance and operations, and became known as a “turnaround expert.” Bradley holds a degree in economics from the University of California at Berkeley.